Fairway Manufacturing Company is one of the oldest and largest distributors in North American of the Eskesen floating view pen. These pens are highly collectable and make memorable gifts to give to your company’s clients or make the perfect souvenir for your gift shop. As has been the practice for many, many years, Floating View Pens are an unforgettable approach to present your attraction, company or city and state. The crafty, moving design will put a smile on everyone’s face. Look through our catalog today and imagine your own design! Once you’ve decided the style you’re looking for, let us help you with perfect your custom design. We have in- house artists that will work closely with you to create the perfect floating pen. 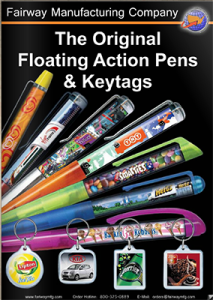 We have created hundreds of souvenir designed floating view pens specific to tourist attractions, States, Cities, Museums, Parks, Zoos, Railroads, and Cruise lines over many decades, with some of our customers producing new themes and designs adding to the collectability of the product. In the late 80’s we worked with Eskesen to replace the familiar photo real art films inserted in the Pen barrel with tumbled gemstones and other natural and man made fillers to mimic the popular Miniature Rock Collection® Pencil line which dates back to 1962 with Millions of Rock Pencils delivered as souvenir and collectibles. We also developed Floaty pens and Floaty Keychains that included the tumbled stone specimens floating in an oil filled barrel with full color Souvenir imprint added. Within a few years we included a clear film inside the barrel with custom imprint that allowed for additional personality in the form of custom Logos and more intricate caption with other unique and natural fillers. These Floaty items were ideal souvenir sales for Cave attractions, Natural History and Science Museums, Mines, Jewellery manufacturers and attractions that featured gold panning and Mining. There are a number of Collector Blogs developed over the years for floaty pens and rock pens. Fairway developed an exclusive agreement to use the Clear Acrylic barrel as a receptacle for different mineral specimen fills for Eskesen products and regularly sends shipments of these gemstone fill products to Denmark. 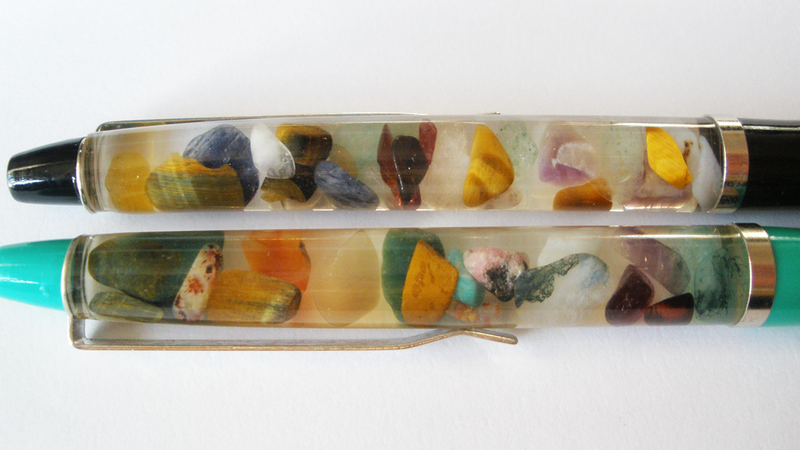 We started with the item as the Trademarked : Miniature Rock Collection® pen with a fill of mixed tiny tumbled and polished gemstones in a colorful mix of over 30 specimens from all over the world. In addition many, individual specimens were done over the years that highlighted various natural products, semi-precious stones and (turquoise, amber, garnet, paua shell, amethyst, metal nuggets, crystals, mini sea shells, colored natural sand, coal etc.) Disney produced a package of Natural American fills to coincide with the release of the Pocahontas movie in 1995. Natural products like seeds, dried corn granules and salt crystals were included as fillers. There’s even a floaty pen Blogger that had an assortment of the Rock fill pens she offered for trade. The Eskesen Pen is one of the most collected and reordered souvenir item with new optional fillers being developed each year. Fairway continues to provide stock and custom Miniature Rock Collection® Pens with the Eskesen versions first developed in 1991 and sold to dozens of Show Caves in the US and Caribbean as a souvenir. Look for Fine Faceted crystal filled pens later in 2015 with custom pens produced and imported in quantities as low as 550 pcs per design. We continue to be the main distributor of Floaty pens in North America. If you’re looking for a great product for your attraction that’s a real collectors item, then contact Fairway Mfg. Co. TODAY!! Fairway Manufacturing Company Custom Design Floaty Pens are the largest North American designers and distributors of the Eskesen Floaty Pens and acrylics. We have been in business since 1952 and pride ourselves on producing a superior floaty pen. There are others out on the market that may be cheaper, but they do not stand up to the Eskesen quality and design. This is a first for us. We’re going online to help serve our clients better. We hope you enjoy our site. You will be able to order at any time by calling 1-800-325-0889. Our site contains information about our products and a way to order quickly and easily. You can view our other products at Fairway Manufacturing Company, located in St. Louis Missouri. When ordering please remember, we’re a wholesale manufacturer, supplier and distributor. You can not order 1 or 2 pens, unless they are listed as such in our online store. There is a minimum of 500 pieces and an art charge when ordering custom designed floaty products. Please feel free to check out our Custom Design Floaty catalog. Thank you for the opportunity to SERVE YOU ! We look forward to working with you in the near future and appreciate your business. Custom Floaty Pens by Fairway Manufacturing Co.